Have you ever seen drawings of buildings that are geometrically impossible? If you’re familiar with the works of M.C. Escher, you’d know that these are optical illusions. But, what if there’s a game that brings these impossible architectures to life and let you explore them inside out? That’s exactly what Monument Valley is about. In this brand new puzzle game from ustwo, you explore stunning and seemingly impossible architectures by finding the hidden paths that run through them. Monument Valley has beautiful illustrations for all its chapters. 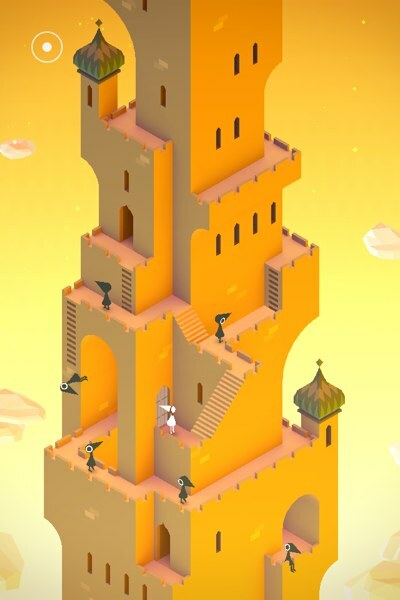 In Monument Valley, you control a silent character called Princess Ida. Simply tap on a location where you want her to go, and she will find the way -- granted that there are no obstacles along the way. But, it would not be a puzzle game if all the locations are easily accessible. Instead, the game is filled with unreachable locations which require you to find the hidden paths that lead to them. This involve rotating big wheels, stepping on platforms, or dragging movable platforms to alter the buildings around you. Also, most of the time you will have to change your perspectives so two disconnected platforms become one connected path for Ida to walk through. The game has 10 chapters nicely ordered to match your learning curve. Later in the game, you may encounter non-playable characters that act as obstacles, as well as movable yellow totems that you can stand on. Stunning visuals. The illustrations by Ken Wong are real works of art. In fact, the developers set out to have every screen a piece of art worth hanging on a wall. Beautiful mechanic. Monument Valley is a game about perspectives. It uses Impossible Cube, Penrose Triangle, and other impossible architectures to create beautiful 3D worlds that you can manipulate by shifting your perspectives. Intuitive gameplay. The game has minimal instructions and tutorials, but it doesn’t take long for new players to figure out what to do. With simple taps and swipes, players can transform the platforms and rotate the world to get the perfect perspectives. Immersive playing experience. 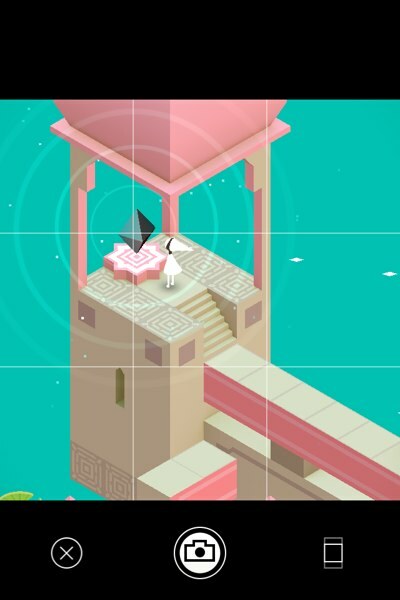 Monument Valley has a soothing background music and sound effects that create an immersive playing experience. The mysterious storyline is revealed a little at a time, so players have a goal to keep them playing. Intricate but solvable puzzle design. The puzzles are designed to highlight the great mechanics and the beautiful architectures, but without being overly complex. There are no wrong paths, only hidden -- so if you are stuck, it’s just because you haven’t found the path yet. Collaborative play in single-player mode. In latter levels, you get an additional character to control: the Totem Pole. This gives the game an extra layer of complexity as you have to figure out how Ida can interact with the Totem Pole to get to her destination. Built-in screenshot feature. The game allows you to take screenshots as you complete a chapter and frame it. You can then save it to Camera Roll or share it to Twitter, Facebook, and Instagram to brag about your achievement. Quality over quantity. Monument Valley is more about experience than mechanics. The game is relatively short -- I finished all the chapters in less than two hours. But to me, each of those 10 chapters is a new and unique experience. Monument Valley has an in-app screenshot feature that allows you to save your achievements in Camera Roll or share it to your social networks. Play with your headset on, otherwise you’ll miss out on the relaxing background music, not to mention the helpful sound effects you hear as you interact with the world. Learn to tell the movable platforms from the static ones. Movable platforms usually have circle handles on their sides, which you can tap and hold to move the platform. Also learn how to distinguish the permanent platform switch from the temporary one. The permanent switch is the one that will trigger a permanent change to the world once you step on it. On the other hand, the temporary switch requires Ida or the Totem Pole to stand on it continuously. When you rotate a platform, do it slowly. Remember that you’re looking for disconnected platforms that would merge into a new platform. Even though the game doesn’t have a specific tutorial for this, you can use a pinch gesture to zoom in/out. This allows you to examine the world closer -- an especially useful feature if you’re playing on a smaller screen. Some people use the game screenshots to create wallpapers for their iPhone/iPad. If you want to do the same, don’t worry about taking the screenshots on your first run. You can always replay a level to frame your perfect shot. Monument Valley is available for iPhone/iPad.